[Lifestyle column written by Alex Dill] It all started with a personal health scare. Between the age of 18 and 25, I thought I could eat and drink what I wanted whenever I wanted. Well, that didn’t last for long! Eventually I was plagued with a bad case of Gastroesophageal Reflux Disease [GERD] which led from one symptom to another. Late nights, I remember having to sit up in bed due to the excruciating heart burn pain. Boy was it painful! Regardless of how many natural remedies, tums and Nexium pills I took, my symptoms still persisted. Alongside the GERD, I had a bad case of acne, I lost weight and my immunity was low as I would always get sick. I was a mess. Little did I know that nothing would help until I changed my eating habits. In quest of improving my health and developing my career, I stumbled across something called Health Coaching. It seemed like the perfect fit. I began studying and learned a lot about the relationship between the foods I ate and my body. Soon after I became a Certified International Health Coach. After learning about my personal food sensitivities through comprehensive blood testing at Northshore Medical & Aesthetics Center and experimenting with therapeutic remedies for my gut, I was able to eliminate certain foods from my diet and was healed in no time. I kid you not, within a few short weeks most of my symptoms had subsided. My personal quest for better health eventually led me to help others with their health concerns. Have you ever been on multiple diets to achieve a certain health goal such as weight loss but still gained the weight back? This is what we call the popular “yo-yo” dieting. Many of us say “I know what I have to do. It’s just difficult doing it and sticking to it.” Well, that’s where Health Coaches come in. Health Coaches serve to bring about healthy lifestyle and behavioral changes by helping clients develop a healthier relationship with themselves and their foods to maximize and maintain their results. It’s all about building the better version of you with the help of a private coach to listen, motivate, monitor, educate and support you. You may think of a soccer coach which helps his players with developing strategies to navigate and overcome the opposing team [obstacles] and score the winning goal [reach your health goals]. After being coached for some time, you learn fundamental skills that become a part of your natural lifestyle, resulting in less struggles and more success. Who wouldn’t want that? Health Coaches also play an important role in the healthcare field. Doctors are educated with a wealth of knowledge about the body, medicine and diseases. They medically treat their patients based on their active health condition and symptoms. Registered Dietitians and Nutritionists make dietary recommendations to help manage and improve their patients’ health conditions. While each health care professional plays a very important role, Health Coaches do as well, but with a different approach. We focus on nourishing life’s “primary foods”, which are not the foods we eat, but rather the things that matter to us the most in life and alters the way we eat. For example, someone may be having stressful times in life with their career or relationship, which alters the way that they eat, eventually causing a health complication. So what is the source of the problem here? Is it the food they are eating? Not so much. The underlying issue is the job or relationship which is causing the stress, which in turn is causing the bad dietary habits, thereby causing the health problem. This domino effect can sometimes be overlooked, resulting in a developing health condition which would not improve. Therefore, Health Coaches take a more holistic approach, looking at all aspects of life to help their clients determine the underlying causes, while helping them discover ways to overcome obstacles and be more successful with reaching their health goals. Other healthcare professionals have the objective to help their patients with their individual health concerns, but may not have the additional time or devotion to discuss other factors that are preventing their patients from reaching their optimal health. Health Coaches play the important role by filling this void. This is by no means competing with other healthcare professionals; instead, complementing them. While the primary foods are addressed, dietary nutrition is the secondary focus. We encourage the eating of natural whole foods and avoiding processed foods. With the knowledge of many different dietary theories, we also personalize nutritional needs to each individual, as one person’s food requirements may differ to the other. With this approach, many people have positive transformations. Why is there a need for Health Coaches? Research continues to support the fact that by incorporating lifestyle changes such as a healthy diet and exercise, we can prevent diseases or help manage them better, as long as we continue the changes overtime. One example of this is the Center for Disease Control and Prevention’s [CDC] National Diabetes Prevention Program [DPP] which is developed to help people prevent or delay type 2 diabetes in those who are at risk for the disease. We should ask ourselves “why are we so unsuccessful with changing the behaviors that are causing our health problems?” Well, committing to the changes isn’t easy when we’re surrounded by constant obstacles and challenges. But with a Health Coach your goals are achievable, as they are the missing link to helping you incorporate and sustain healthy lifestyle changes in a unique, holistic way to improve your health and happiness. That is why I have dedicated myself to support and inspire those who are seeking long-term results, need someone to hold them accountable and wish to see an improvement in their quality of health and life. 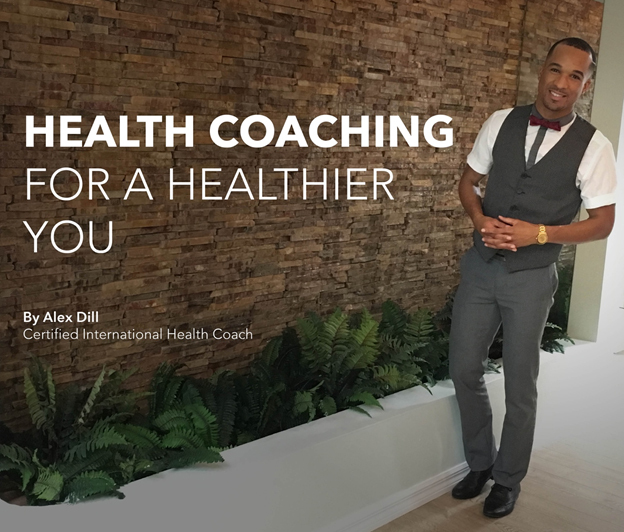 - Alex Dill is a Certified Health Coach. He received his training at the Institute for Integrative Nutrition in New York City and is also certified by the International Association for Health Coaches. He can be reached at Northshore Medical in Devonshire. JohnBoy: End-of-April-Fools-Day!! This is a joke right?